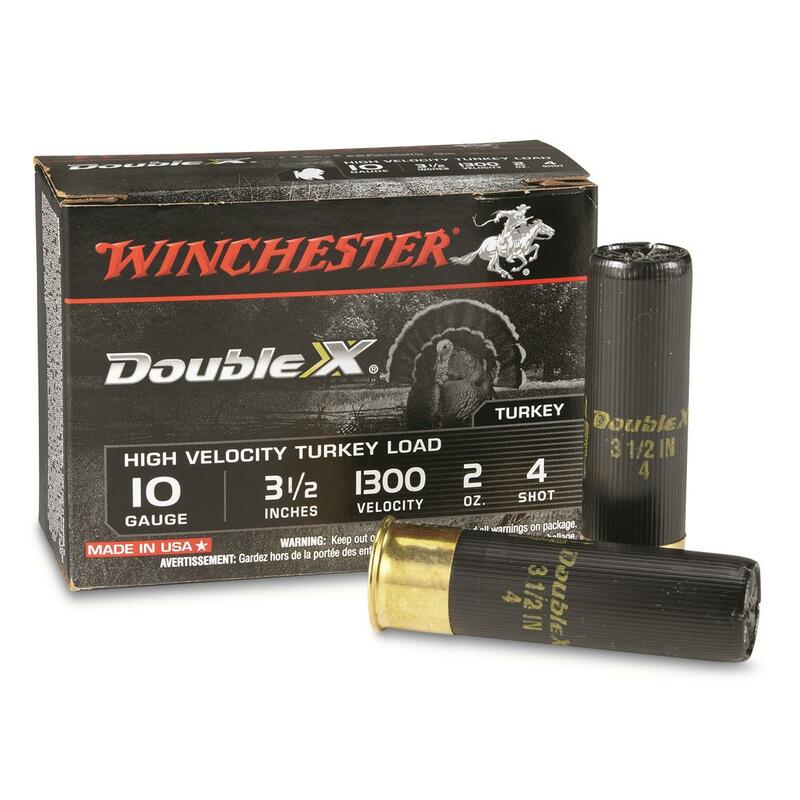 Winchester®'s hardest-hitting Turkey Load EVER. High Velocity Turkey Loads are the most technologically advanced, hardest hitting Turkey Loads ever developed. Featuring true magnum energy, and a scorching muzzle velocity of 1,300 FPS. Winchester Double X High-velocity Turkey Load, 10 Gauge, 3 1/2 , 2 oz., 10 Rounds is rated 5.0 out of 5 by 9. Rated 5 out of 5 by BILL from great price hope to kill something soon. Rated 5 out of 5 by LAWRENCE from MY YARD IS VERY SHORT, ONLY 30 FEET. THEN IT DROPS 30 FEET DOWN TO LAKE ONTARIO. THE COYOTES USE MY YARD ALL THE TIME ON THEIR WINTER ROUTE. THEY GET WITHIN 3 FEET OF MY PICTURE WINDOWS. I HIT ONE WITH THIS 10 GUAGE ROUND AND IT BLEW HIM INTO THE LAKE. BURIAL AT SEA. Rated 5 out of 5 by MARK from Winchester 10 ga. Supreme's are the best-I was real happy The Guide had them at such a good price and free shipping.Spring gobbler season will be here soon!